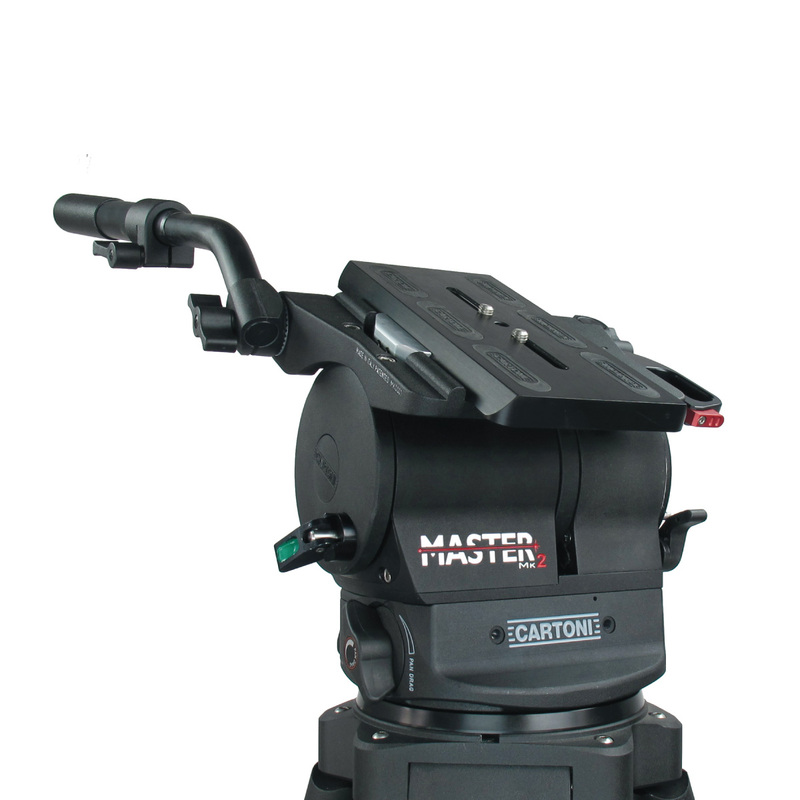 The new Master Mk2 is the ultimate CARTONI Fluid Head designed most specifically for HD applications, Film, ENG & EFP camera systems. The Mk2 counterbalances very light cameras from 3 Kg (6.6 lbs) all the way to 30 Kg (66 lbs) making the Mk2 suitable from the smallest HDV camera to fully loaded RED, Alexa, F65, C300 (etc) cameras with all of the trimmings. This new CARTONI counterbalance system is an evolution of the patented CARTONI “Wing” system and allows a perfect performance throughout the +/- 90 tilt range, with perfect stops at any angle. The frictionless variable fluid modules perform a wide variety of fluid drag for the best smooth and precise movement in any shooting situation. All operating knobs and levers are conveniently located and easy to reach with a special care for user-friendly ergonomics. The Master Mk2 comes equipped with one telescopic pan bar, standard quick release sliding camera plate, (EuroStyle plate optional) illuminated spirit level and digital readouts for drag and counterbalance settings. The Mk2 has a flat Mitchell standard base and an available 150mm bowl converter to make the Mk2 suitable for all leg options and Dollies.